You can’t beat video for marketing your school. A well-crafted film always packs an emotional wallop that puts full-color brochures to shame. A stirring soundtrack, emotional testimonials, moving pictures: students bounding up the stairs in the morning, the anchor on the track team sprinting toward the finish line as kids cheer from the bleachers, the chorus practicing in the assembly hall, faces aglow with concentration…. A powerfully produced video will move audiences to tears, propel prospective students to choose your school, and get funders to reach for their checkbooks. So who makes this film? What criteria can be used – and what questions should schools ask as they look for someone to tell their story? 1. Every school has a story to tell – what’s ours? The biggest mistake schools make when commissioning a video production company is a lack of clarity about the film’s reason for being. “We need one because everyone else has one” probably isn’t enough. What aspects of the school do you want to stress? You don’t need a script or an outline, but being able to tell the producer what message you want to send will be crucial. It’s your story, after all – they’re just here to help you tell it. 2. Who is our audience and what is our goal? The simplest question: where will the video be seen, and by whom? Will it live exclusively online? Play at an event? A stand-up cocktail party, or a sit-down fundraiser? (The length of the video rides on the answer.) Is it going to be used as an Admissions video? Or is the purpose to raise money from alumni for a Capital Campaign? Can the video be repurposed? Does the school want several versions – one for an alumni party, one for the homepage, and a short one to send in an email? 3. Do we want the best company out there? There is no best. Just as a student shouldn’t search for the best school, but the best fit – so too with a video production company or videographer. You want the one who will tell your story the best, understand your school and distil it to its emotional core in a way that will move audiences. 4. So can we hire my nephew? He did a video on his iPhone about his summer bike trip, and it was really funny. 5. So should we hire an alum of the school? She knows the place inside and out. That’s why you should be careful about hiring her. An outside eye is crucial to telling your story to the world. An insider can be too close to the forest for the trees, jamming a video so full of inside jokes it means nothing to a wider audience. No one wants to go to a party and watch slides of someone else’s fishing trip; an insider may not reach an audience that isn’t already on her side. 6. Okay, we’ll go with an outsider. What’s the most critical thing we need to hear from them at our first meeting? In a word: nothing. You don’t want to hear from them. You want them to hear from you. Don’t forget: it’s your school and your story that’s being told. You want them to ask questions, to show a genuine interest in your school, and above all, to listen. A good film is built on dramatic moments of and intimate connections, and a good videographer will demonstrate the ability to listen and observe in the first meeting. 7. Can they tell us how they did it at previous schools, or with other clients? They can and should discuss relevant experience, but be careful they don’t have a One Size Fits All approach. Our production company keeps a motto on the bulletin board in the editing rooms – ‘this film has not been made before’ – it’s there to remind us that yes, we may have been hired for our expertise and our experience, but if we don’t remain open to our subjects, we will fail. School A is not the same as School B, so why would their videos be the same? 8. Can they tell us their plan? Yes. Unless you’re hiring Frederick Wiseman to sit with his camera in your school for an entire school year, it’s vital to hear how the producer will proceed. How will they approach the work? How many days of filming are required? How much time is necessary for each interview? Will they require someone from the school to serve as a liaison, or would they rather wander the school on their own? And who will tell your story? Will you need to provide students, teachers, or administrators to be interviewed? What about alums or parents? Trustees or Board Members? Very often the head of the school is not necessarily the person who can speak most eloquently about your school — but for political reasons it may be necessary to include her. Are there other political considerations about people (valuable trustees, for example) who need to be interviewed? 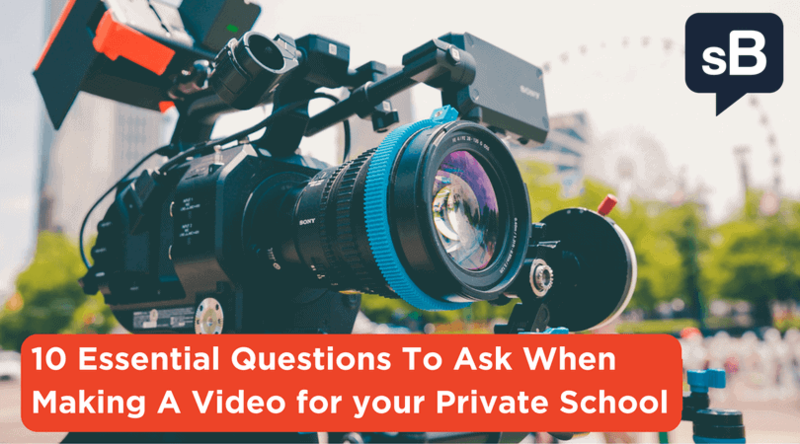 The videographer who doesn’t ask these kinds of questions may not be the best to entrust with the task. 9. What is the videographer’s unique style? How did the videographer come to this line of work? When they’re not doing school videos, what else do they make? Social justice documentaries? That may be the right choice for one kind of school, while another may prefer the guy from Madison Avenue. A gritty independent filmmaker or a Hollywood, rom-com director? Where did they grow up, cinematically speaking? What are the movies they love, and that made them want to make movies in the first place? Don’t be afraid to ask – do they prefer films with humanity and humor, or are they action movie fans? The answer may reveal what kind of video your school ends up with. 9. How important is it that they be up-to-date with the latest technology? The most important thing is story-telling ability. To the extent that they are conversant with the newest technology and can employ it in the advancement of telling your story, then yes, the latest gadgets (i.e., drones flying over your soccer fields, etc.) can make a huge difference in the emotional impact a film can have. But beware the videographer who only wants to talk about his latest equipment – you may wind up with a video with high production value but little impact. Here again, be careful of the rate sheet and other indications that your school is being slotted into a pre-existing formula. Yes, it would make things easier all the way around if everyone knew the price of a ‘school video’ – but as each school video is unique, the price is probably going to have to be the result of a conversation. There are so many variables – production time, editing time, and length, for example — that even the ballpark estimates for each school would be different. But a final word on cost: Your video is a powerful, front-facing message to the world – it’s probably best not to skimp on it. The bottom line: You love your school, and there’s no place on Earth that is exactly like it. Make sure your videographer knows that. Awesome post! This is a great planning guide before looking for firms! Another question to ask is, “can we develop the capacity to do this in-house?” I’ve found that for many schools & some kinds of video the answer might be yes – with a little coaching and gear advice!